Mitsubishi Electric Visual and Imaging Systems Division will show its newest display wall cube – the 60” Slim Cube – at InfoComm this week. 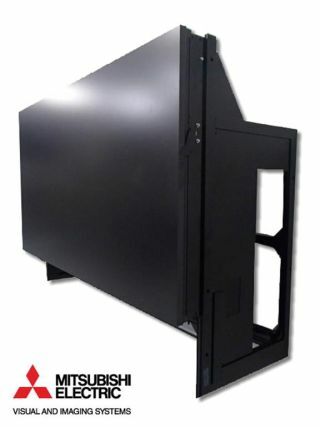 This space-saving cube is an alternative to LCD flat panels designed specifically for applications that require near-zero bezel, true 24/7 continuous operation, and a low total cost of ownership. The new VS-60HS12U Slim Cube will be on display in Booth #C-8308 at InfoComm in Las Vegas, June 18-20, 2014. The rear-projection LED display cube measures only 20.5 inches deep, which is approximately 26 percent slimmer than Mitsubishi Electric’s similarly sized, conventional rear-projection LED display cubes. Additionally, depending on how it is installed, the footprint depth of the cube frame stand can be as shallow as 15.2 inches. “Some integrators choose LCD monitors in rooms with limited real estate and budgets, only to find that gridlines are distracting and LCDs are not robust enough for 24/7 operation,” Chan added. Mitsubishi Electric’s VS-60HS12U Slim Cube offers a better alternative: it is slim enough for the smallest control and operations rooms; it has almost zero-bezel for easy-to-see, clear video and data across the entire wall; and because they are so long-lived, the overall total cost of ownership is low.